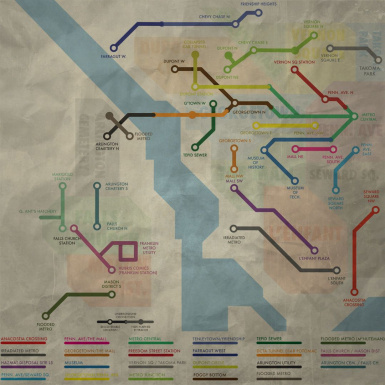 Replaces the ingame Metro map with a much improved, more useful version. Now it actually serves its intended purpose: to help you get from point A to point B without going nuts! There it is folks! Only 10 years after the game's release...better late than never I guess. 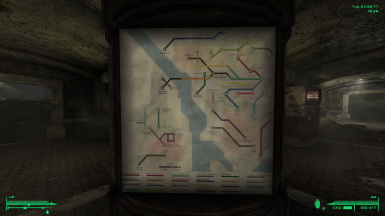 Based off of Xiempie's amazing work that he posted on Reddit, I present to you my (not so) humble work: A Decent Metro Map® for Fallout 3. Just pop the damn thing in your Fallout 3 install folder and enjoy not being lost undeground for hours anymore! Original release: Slightly faded colors, some dirt and scratches. 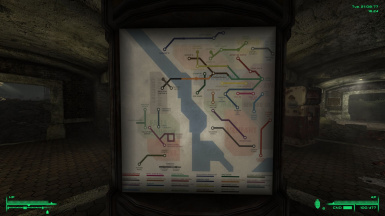 Metro map and lightbox are the same. 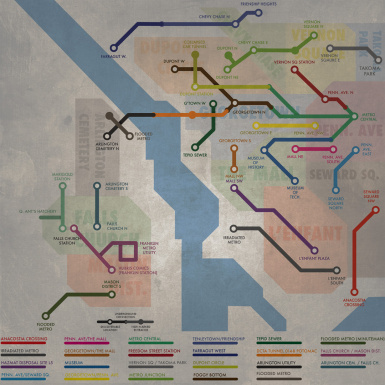 Dirtier version: More faded colors, yellowed paper, extra grime on both the Metro map and the lightbox. Dirty map only: More faded colors, yellowed paper, extra grime on the map. Lightbox is the same as original release. (Makes sense that maps exposed to the elements suffered a bit more than those that stayed underground...or maybe the lightbox is plexiglas or something ^^). Put the included Data folder in your Fallout 3 root directory, overwrite if needed.